Blain: "My Recent US Trip Was An Eye-Opener - Poverty Has Never Been So Visible On The Street"
Another fascinating weekend… It’s a holiday in the US, and much of UK is off for mid-term. I’m still trying to digest the importance of last week’s news about Amazon pulling out of its New York HQ2 deal in light of protests by liberal lefties. I’m thinking it’s a very interesting moment, and rather changes the game. How much do current events, like Amazon, change the game of Macro Strategy decisions? In the past the role of strategist was to carefully scrutinise, analyse and conceptualise Central Bank interest decisions, input the available economic data into our calculations, spice it up with some expectations about global trade prospects, and make rosy assumptions about growth and consumption to determine (ie; guess) if stock and bond prices will rise or fall, and therefore what to buy. We assumed we lived in a solid-state political and employment universe where its binary that consumption will rise in line with employment, and that any job is a plus job. Recent events demonstrate that simple equation may need massive revision. Over the past few years we’ve been forced to factor in the irrational and unpredictable politics of populism, and their effect on markets. Now our expectations about employment and consumption are under pressure. New York’s political leaders look stupid, confused, disjointed and lost. The young congresswoman AOC (Alexandria Ocasio-Cortez) might be smiling like a winner today, but strikes me as a child who expects congratulated for throwing her new toys out the pram. How will she explain chasing away 25k well-paid jobs as the core of her presidential strategy and her New Green Deal? 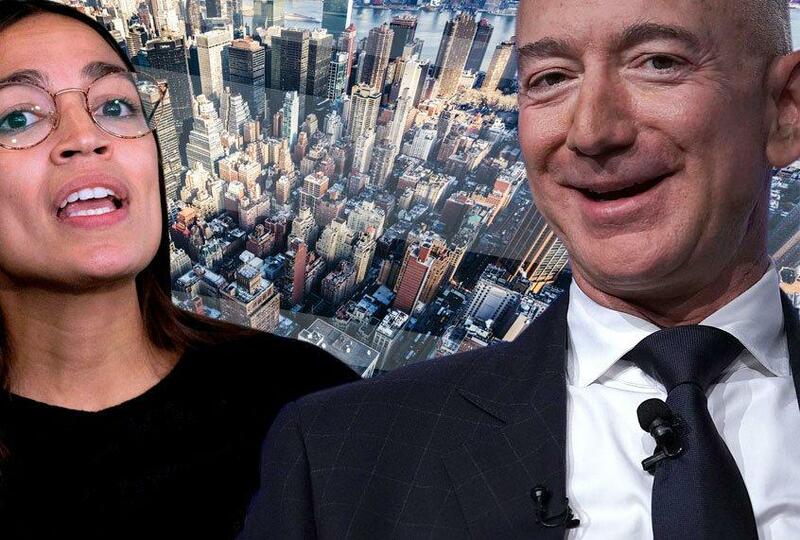 Where Congresswoman Alexandria Ocasio-Cortez has clearly scored is painting Jeff Bezos as the villain - arrogant, threatening, and a serial tax-avoider. That chimes with a large part of the US electorate – and sets some dangerous precedents in terms of populism – Remember how close Bernie Sanders came? The US should be the happiest place in the world these days. Employment among minorities has never been so high. More women than ever before are in the total workforce, which now exceeds 63% in terms of the participation rate. Years of economic growth, and more recently Trump’s tax boost last year, means investment has been strong. Corporates are doing well. Yet, after 10 years of ultra-low interest rates, tax-giveaways, and a massive increase in the wealth of the richest 0.01% of the US population (who now own a staggering 10% of the wealth! ), wages for the rest are only now beginning to show any signs of upwards pressure. While Bezos and his fellow trillionaires wonder which slice of cake to guzzle next, the facts are the poorest workers in the US are in poverty. Over 60% of the lowests’ incomes go to cover their housing and transport costs, the next 25% on food. The 50% percentile income bracket - definitionally the “middle class” - spend 44% on housing and travel. More than half the population aren’t saving for their retirement, but are scrabbling to put food on the table today. My recent trip to the USA was an eye-opener - poverty has never been so visible on the street, and it feels the income-inequality debate is bursting out. No wonder populists are calling for the rich to be taxed till the eye’s pop. But the US needs to do two things – create a fair tax and equality system, and fix what’s broken in its society and economy. The classical models of modern states suppose its role is to provide these indivisible services like law and order, defence and care. All citizens share in the benefits of membership, with the basis the strong should protect the weak. We’ve seen the care function morph into the emergence of education, pensions, healthcare and social services - which are as major costs states now bear. There is the inbuilt reluctance of these who don’t need such services to pay for them. Why should a rich man pay to make the poor comfortable? Because, if you don’t… eventually they will eat you. Simple as – it’s the cost of membership. Historically, the Americans have always done the right thing after exhausting every other possibility first. Roosevelt’s iconic New Deal followed the government’s disastrous non-intervention in the wake of earlier financial crash. The Americans can do it again – some variation on AOC’s Green New Deal that balances growth, consumption, wealth, health, and entrepreneurship is possible. A programme that addresses a re-jig of society in terms of educational relevance, green environmental industries, and a massive-across-the-board infrastructure rebuild, while also balancing care for those in need at the core of a new approach. That’s a real challenge, but one I’d expect the Americans to find… eventually. If it doesn’t happen… expect more instability and mad decisions like stopping new well paid jobs and increasing economic strain. In which case... where else to invest?